"If you want an “outside the box” thoughtful gift, this is it." "Perfect for the artsy or aesthetically inclined couple." "Feels like a high-end hotel robe for much less money." "It's the perfect accessory for anyone who likes to explore." "Perfect for everything from whipping up pancakes to storing leftovers." "Heavy and durable in feel, but delicate in style." "There's not a couple out there that won't appreciate the convenience." "Anyone who loves to cook (or who loves to eat) will adore this gift." "A unique wedding gift that the couple can receive again and again." "It's helped active pups stay busy while their owners are away at work." If the newly wedded couple has already lived together for years, they probably don't need a bunch of pans or plates — so instead, gift something that’s made just for them. 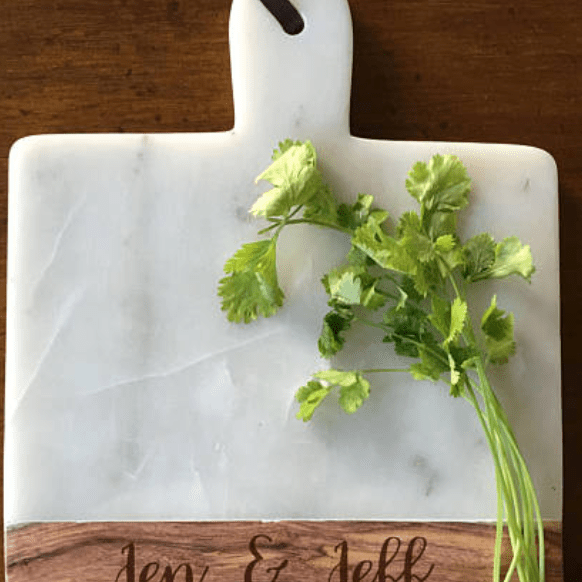 For the couple that entertains, this stunning DeskCandy Marble and Wood Engraved Cheese Board is the perfect gift. Made from marble and acacia wood, it's entirely customizable. 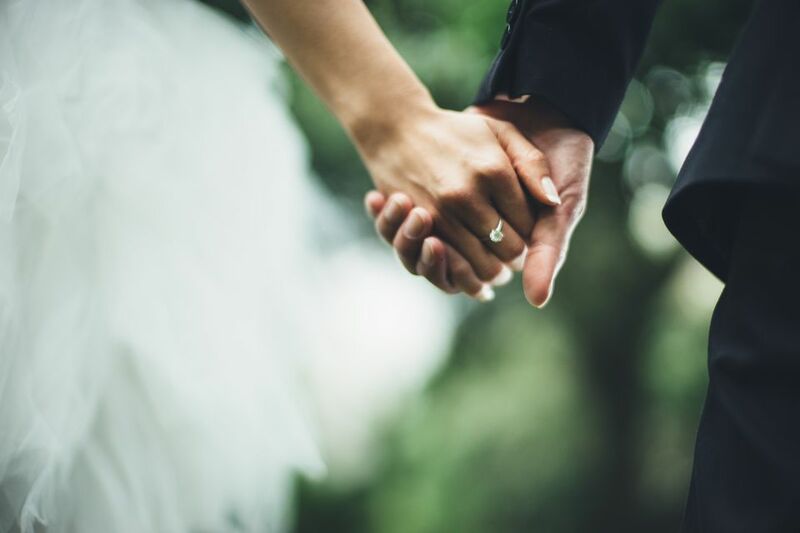 Commemorate their special day and their new married life with a gift that's as beautiful as it is useful. You can choose from seven different font styles, ranging from whimsical boho to traditional and classy, which allows you to pick something that’s a fit for their style. It's a sturdy little piece, weighing 4.5 pounds and measuring 9.3” by 9” (11” with handle) with a beautiful genuine leather hook. Reviewers rave about the high level of craftsmanship, stating that the artist is delicate and attentive to detail. Keep in mind that due to the custom nature, each piece can take up to two weeks to arrive - so plan ahead. If you want an “outside the box” thoughtful gift, this is it. Another customized gift from the heart, the Braumbirdy Serif Date Memento is a piece of artwork that will commemorate their big day. Large, graphic letters depict the day they said “I do” in a modern, trendy style on your choice of high-end paper. You can choose between six color combos ranging from black and white to maroon to gray and in any size ranging from 5” x 7” to a whopping 44” x 60”. It comes either unframed or framed, with UV-plexi or standard plexiglass and a choice of various materials like reclaimed wood, copper or chic-looking metal. Everything about the Seif Date is customizable, so you can create a unique gift just for them. Perfect for the artsy or aesthetically inclined couple, this original gift is one they'll love to show off. Now that the stress of wedding planning is behind them, give the lucky couple a reason to take a load off. Robes make a great wedding gift for almost anyone, and you can't beat the quality of the Parachute Home Robe. This unisex robe is made from 100% long-staple Turkish cotton and comes in either white or gray. Each robe works for any gender, with sizes ranging from small to extra-large. The Parachute robe is a favorite for its ultra-plush quality that (importantly) won't cling after a shower. It has two front pockets, a waist tie and a shawl collar. Plus, the company allows for a 60-day trial, so the couple can try it out and return if it's not quite right. Reviewers consistently rave about the Parachute Robe’s quality, remarking that it feels like a high-end hotel robe for much less money. Between the perfect fit and the luxurious feel, this is a robe they'll never want to take off. Take a peek at some of the other best robes you can buy. If the special couple is one that spends more time outdoors or in their car than at home, the L.L. Bean Insulated Tote will easily become the most reached-for item in their house. This 11.75" x 16.75" cotton canvas tote is lined with BPA and PVC- free installation that will keep their beverages and snacks cold all day long. Whether on a hike or at a picnic, it’s the perfect accessory for anyone who likes to explore. It includes a detachable shoulder strap, is leak-proof and incredibly easy to clean. The tote is available in red, green or blue, and can be monogrammed with the couple’s initials. Gift along with a few bottles of your favorite wine for a meaningful yet useful gift they’re sure to love. If you're looking for a gift that's as practical as it is thoughtful, the Crate & Barrel Glass Nesting Bowl 10-Piece Set is an excellent choice. This is the gift your friends didn't know they needed but will use again and again (and think of you each time they pull it out of the cabinet). This dishwasher and microwave-safe set includes 10 glass bowls, perfect for everything from whipping up pancakes to storing leftovers in the fridge. Each bowl nests into the next, so they take up little real estate in a cabinet, but will quickly become some of the most-used items in any kitchen. The smallest bowl is 2.25-inch diameter, while the largest is 10.25-inch. The set’s hundreds of reviews are full of compliments about the bowls’ go-to quality, with many owners saying they use them nearly every day. If you're looking for a practical gift for the couple and nothing is left on the registry, they'll be glad you thought of this. A wedding is the best time to give a gift that will become a future heirloom. This exquisite Kate Spade New York Calhoun Court Vase is a stunning accessory that the newly married couple will cherish for years to come. This modern take on a traditional cut glass is etched with a crisscross pattern and will look amazing on any tabletop or shelf. It measures 5” x 10”, and looks just as beautiful on its own as it does displaying flowers. Owners remark that this Kate Spade vase is heavy and durable in feel, but delicate in style. It’s the perfect “forever gift” for any lucky couple. Married life means sharing TV shows, dinners at home — and yes, chores. Help make the first year of marriage a little easier with the iRobot Roomba 690 Robot Vacuum. This high-performance vacuum loosens dirt, lifts and suctions without ever needing to lift a finger. Sensors help control the Roomba, allowing it to focus on dirt-heavy areas in the home while you’re away at work. The Roomba also works with Amazon Alexa or via a phone app, so it can be programmed and controlled from afar. When this little robot is done cleaning, it tucks away into a wall dock until the next time it goes to work. It also transitions from carpet to hardwood seamlessly and is perfect for pet owners and parents alike. See more reviews of our favorite robot vacuums​ available for purchase. Some of the best wedding gifts are those that the couple would never buy themselves but end up becoming totally indispensable. The Anova Culinary Sous Vide is a powerhouse kitchen gadget that is perfect for home chefs and food lovers alike. A sous vide system works by using temperature-controlled water to cook meat, seafood and vegetables to perfection. The Anova device allows one to program the temperature using a phone via Bluetooth, a nifty feature that gives the couple freedom to let dinner cook itself. It can cook at temperatures up to 210°F with a timer that can program for as long as 99 hours. As heat and water circulate the food, it cooks to a restaurant-level quality that is nearly impossible to achieve with other cooking methods. The food is placed in either a sous vide-specific plastic bag or any strong ziplock, submerged in the water - and voila! All in all, anyone who loves to cook (or who loves to eat) will adore this gift. Take a peek at some of the other best sous vide cookers​ you can buy. Looking for a gift that keeps on giving? The Best of “Mouth” Monthly Subscription Club is a unique wedding gift that the couple can receive again and again. You can prepay either three months, six months or 12 months in advance, and each shipment includes four to five curated artisanal food products. With products ranging from cocktail mixes to chocolate bars to pickles, the Mouth subscription box has something for everyone - each item handpicked by Mouth staff. The perfect gift for the adventurous, a subscription box is a great way to give a couple something to look forward to every month. Here's the perfect gift for the couple that brought their dogs to their wedding. Any animal lover will adore the Furbo Dog Camera, a device that allows a pet owner to see, hear and reward their furry friend even when they're far away. This Wi-Fi-enabled HD dog camera has night vision and a powerful 160° wide-angle lens so that they can zoom in and see their pet from every corner. But the main attraction of the Furbo is its ability to hold up to 100 treats that can be tossed using an iOS or Android-enabled phone. It sends a notification when the dog barks, and even take pup selfies when the dog is interacting with the camera. It’s also compatible with Amazon Alexa, and can be programmed in advance to toss treats to the lucky pup. This is the perfect gift for any dog-obsessed couple. Need some more help finding what you're looking for? Read through our best gifts to buy for animal lovers article.